Libby's Little Addiction: Hero Arts 2018 Catalog Release Blog Hop + Giveaway! Hero Arts 2018 Catalog Release Blog Hop + Giveaway! Hello and welcome! Today is an exciting day over at Hero Arts! The new 2018 Catalog products are launching in the Hero Arts store! I'm part of a giant blog hop to celebrate - you should have arrived here from Kelly Latevola's blog (and I'm sure if you did, you are still swooning - can't wait to see what she colored today!). If this is your first stop, go ahead and head back to the Hero Arts blog to start from the beginning! Today I'm sharing a few of the cards I made for the printed catalog. I had so much fun playing with these products! 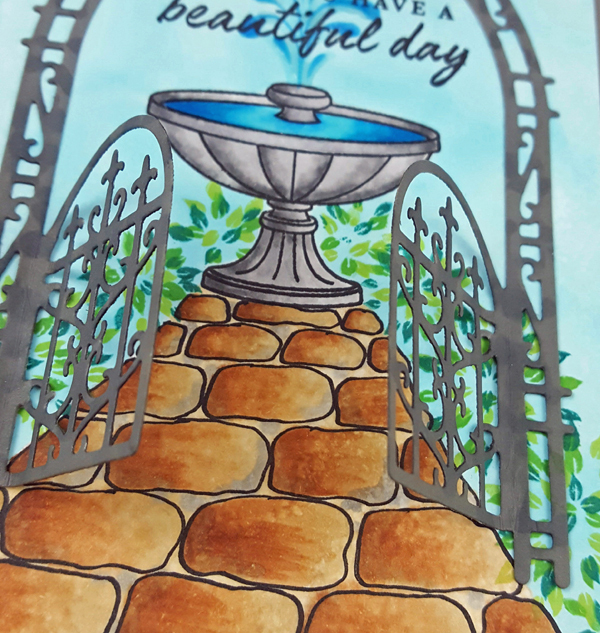 For my first card, I created a little scene by combining the Make a Fountain set with the Trellis Fancy Die. First, I stamped the parts of the fountain and colored it with my Copics. The path leading up the fountain was drawn by hand and colored. The little bushes along the path are another new set, Layered Topiary - I stamped them without worrying about lining them up perfectly. When I added the trellis to the card, I only partially adhered it, so the doors can open. Another detail that you can't really see in my photos - I added some of the new Crystal Clear Lacquer Pen to the water of the fountain, to make it look "wet". The next card was a little bit of a labor of love, but I really do love it! There are several fun new Color Layering sets in this release, which I love. But one thing I especially love is that with most of them, the final layer is an outline image, so you can use that line image for coloring! Here I used the Color Layering Elephant set. I stamped and masked the elephant several times to create my "herd". To give the gray elephants some variation, I colored them with three different "families" of gray Copics - toners (T1, T3, T5), neutrals (N0, N3, N5) and cools (C1, C3, C5). For my stand out ellie, I went with violets (V04-06). I had to add a little pink (R20) to their cheeks, because that's what I do! The message I used is from a set called Weird and Wonderful. There are so many great messages in this set - I love all the weirdness! For my next card, I used another favorite from this release - Support Prayers Love. This stamp set was developed as we were all reeling from the natural disasters that struck last fall - the multiple hurricanes, the fires in California, the earthquake in Mexico. Hero Arts has a long tradition of giving back - it's one of the many reasons I am proud to work with this company. You can learn more about their efforts on their Giving Page. All profits from this stamp set are donated to charity. There are four new Destination woodblock stamps for fundraising as well - Destination Puerto Rico, Destination Napa Valley, Destination Mexico and Destination Florida. They go along with the Destination Texas stamp, which already existed but was designated as a giving stamp last fall. For the card above, I used a combination of Copic markers and Bold Inks. A great thing about the Bold Inks - they are Copic-friendly, so I can color and not worry about bleeding. The hands are a solid image, so I stamped them in Caramel, using second generation inking, the added E00 Copic coloring right over them. The Earth images in the background were stamped in Moss ink, and then colored with BG11, while the heart-shaped Earth was stamped in Intense Black and colored with G24 and BG13. And finally, my last card - for this one I played with a GORGEOUS new woodblock stamp called Flowering Nasturtium. I heat embossed it in gold on black cardstock, then colored with my colored pencils. I love the vibrant look you can achieve when doing this! I added a few sequins from the Champagne mix to finish the card. The gold matting was done by painting with Kuretake Gansai Tambi Starry Colors gold paint on Kraft paper. It's so shimmery and pretty in real life. The gold embossed message is also from the Weird and Wonderful set that I used above. 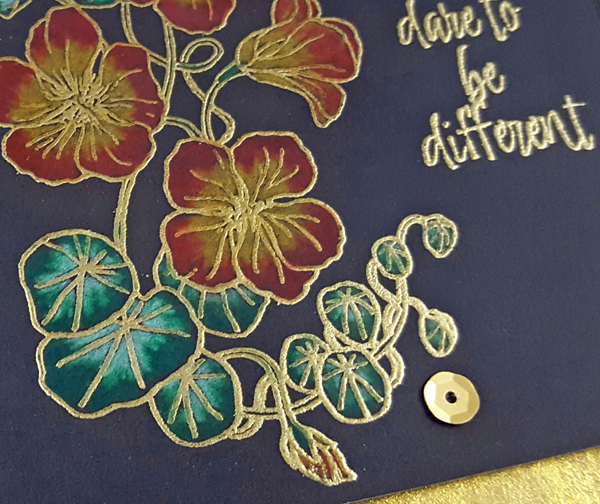 The Flowering Nasturtium stamp also has a matching die available, which is super handy! Alrighty! That was a lot of card info! Now it's time to hop. The hop is both huge and AMAZING - I'm so honored to even be associated with this talented list of stampers! Be sure to visit everyone along the hop and leave comments - Hero Arts will be giving away THREE $50 gift certificates to lucky winners drawn from the blog comments across the hop. You have until Thursday, February 22 at 11:59 pacific to leave those comments! Be sure to visit Lucy Abrams next - she is a longtime friend of Hero Arts and is so sweet and so completely amazing - we're absolutely thrilled she's part of our hop today! I've only been waiting forty years to see this beautiful elephant card again - you are amazing!! You're right - I am still swooning over Kelly's cards!!! But wow love your work, Libby!! That first scene rocks!! Wow, fantastic cards!! That fountain is gorgeous! So much goodness Libby!!!! Love them all especially the ellies! Wonderful cards! I really love the one with the mass of elephants! Oh my goodness! These are beautiful! The elephant card is my favorite! your take on the gateway fence - having it move - genious! I always like the elephant cards... so cute! Oh my, what beautiful cards. Thanks. Amazing cards! I love the elephant one!! The fountain card is just stunning but I LOVE elephants. Thanks so much for sharing your amazing talents with us all. Blessings! Gorgeous cards! Thank you for the inspiration! I love the purple elephant on your card! The Nasturtium card is magnificent!! The elephant card is such a good idea. Thanks for the inspiration! I am in live with that trellis.Thank you. All the cards are outstanding but the black and gold has to be my favorite. We Stand Together <3 absolutely love! WOW...great creations! Love them all! Love the fountain card with the gate. The "Dare to be different" black and gold card has to be my favorite. Love all of these, especially the elephants! Love the variety of your cards, Libby! You're so talented! Very much fun going on a hop! Love the new products! I am totally swooning from Kelly's cards however yours are equally "swoon-worthy" Libby. Oh my goodness, I LOVE them ALL! your elephant card is over the moon fantastic!!! The elephant card was certainly worth all the time. I actually said "Oh, wow!" when I saw the gold on black flowers. Beautiful! The elephants with the sentiment made me so happy :) I think that sentiment set if going on my list. There are so many stamps I love from this release! I love the layered look of your garden and the sweet point in your elephant's so cute. Love the cards - beautiful fountain - fun elephants! Thanks! Your cards are beautiful ! I specially love the black one, it's very elegant. Gorgeous cards - love the purple elephant and the nasturtiums stamped in gold on the black card are stunning. Thank you for sharing so many different ideas! Loved the sentiments on the cards, too. So many beautiful cards! That nasturtium card was so striking with the color on the dark background. I do recognize some of these cards from the catalog...amazing! so elegant! I love the feel of these cards! I want to go through the gate and splash the water. I love the elephants. This would be perfect for my bff. 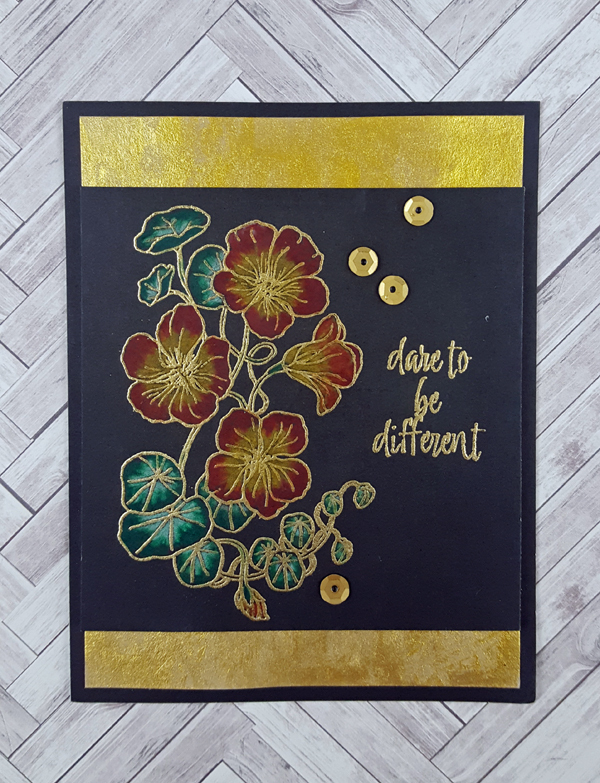 Gorgeous cards, I especially love the colored pencil nasturtiums on black CS. Lovely and Inspiring Cards! Thank you for sharing your creativity. Love your flower card. I forget how pretty block stamps can be. Great sectional of cards to show the diversity of this release. Beautiful cards--thanks for the wonderful inspiration!! Wow! As always your cards are simply amazing! Great colouring technique!!! ❤️ your creations are beautiful. Lovely cards! I really like the one with the globes! Love that “pencil on black” card. Everyone of your cards are amazing! So much wonderful eye candy! LOVE that beautiful trellis! I want to see a real live purple elephant... cool idea! and those gold embossed nasturtiums on black are absolutely stunning!! I love the "herd" of elephants! Awesome cards! Love the garden gate card. All of your cards are great! I can not get over the elephant card....the coloring is amazing and that purple elephant really stands out so perfectly. Although all your cards are lovely, the garden gate card is by far my favorite!! It just draws you in and is truly amazing! What a versatile and eclectic set of cards Libby. I love them all and had to go back several times and look at them. Beautifully crafted. the masked elephants has to be my favourite though. I just love the hugeness of the whole thing and the purple elephant made me smile. The nastursiums are pretty awesome too! Thanks so much for sharing. I really love your cards! That first one with the scene is beautiful and so is the one with flowers on black card stock! Hero Arts had come out with such a variety of new things in this catalog and I can't wait to start getting some of them! Thanks for sharing with us! Wonderful cards. Love the garden scene on the first one. WOW! You have created amazing scene's with each of those cards. You have fantastic talent! Loved them all, but the gold bottom one the best. All of your cards are beautiful! Love the trellis and the elephant cards the best. I love all your creations! My favorite is the one with the elephants because I love elephants and I'm weird! LOVE your card! That gold embossing on the Navy cardstock is stunning! I love the themes you put into your cards! So much talent here on the hop! Thanks for sharing yours! These are all fabulous!! That first one is awesome! I love the gateway opening up into the garden; so pretty! Beautiful cards! Totally love the flowers on black cardstock colored with pencils! Gorgeous! Fabulous cards. Love the weird and wonderful stamp set. It's a must have. My friends and I are definitely weird and wonderful. Love these and this company!! Such cool cards - I really like that fountain! Wow!! You have been super creative! I love the purple elephant and the fountain card. The fountain card with the gates reminds me of Savannah or Charleston with the old world southern charm. Magnificent! 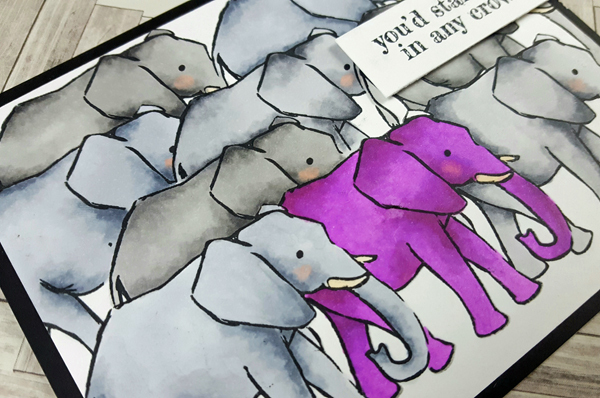 Every one of these cards is stunning, but that purple elephant jumped out at me -- love it! I love both the elephant cad and the colored pencils on the black! Your cards are lovely. Thanks for sharing your creativity. All of your cards are amazing! I love elephants, so of course, that is my favorite one. Thanks for the inspiration! Awesome cards! Love the fountain and trellis! Lovely scene! You have totally outdone yourself with these! Wonderful set of cards. Thanks for sharing. Oh, I love your colorful stand-out elephant! It truly made me smile. I never saw a purple elephant (or was that something else?). Love this one and your other beautiful cards. All are amazing, I would say! Fabulous cards. 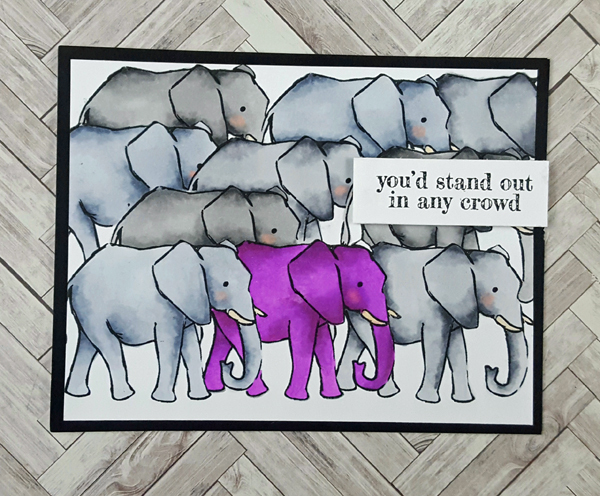 Love your "stand out" purple elephant. Totally awesome cards! I really love that darling elephant card & all the wonderful sayings in that set!! Thanks for giving us such a variety of cards using different coloring methods. You are very talented. Great assortment of card styles...I'm loving the delicate look of the trellis die cut! Fantastic cards! Fun, graphic, elegant... you've captured them all. i love the gate and fountain. Very clever. The elephants brought a big smile to my face. Great job! my grandaughter loves this elephant and wants that card so I will be making her one...thanks for the inspirations! I love all your cards - all so different but well done! Awesome cards!! Especially loved your fun Elephant card & that gorgeous nasturtium card!! I really like your use of the trellis and fountain sets, but, honestly all of your cards are fantastic. Lovely cards. I love the herd of elephants, and the colored pencil on black is great, too. TFS. I so appreciate the time, energy, and creativity that went into making these cards. Especially like the herd of elephants and the sentiments, especially We Stand Together. Wonderful cards! My favorite is the one with the purple elephant, just too fun! I love how different each card is. All of them are amazing, but that nasturtium card is a masterpiece! Oh my goodness !! Each of your cards are simply breathtaking ! So many unique cards! Thanks for the inspiration! Great variety in the cards that you shared. 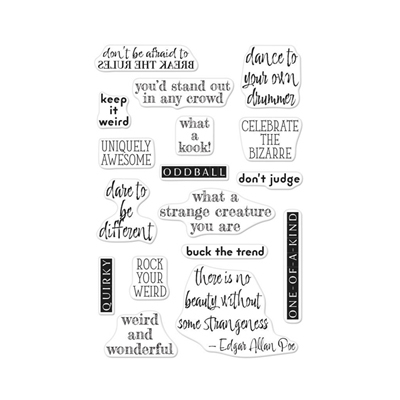 I love that encouraging Weird and Wonderful sentiment stamp set! Thanks for sharing. Wow! All 4 cards are amazing! I think my fav is the Nasturtium though cause I've been really digging florals on dark paper lately. Yours came out just beautiful! Absolutely fabulous. Love the colouring on black card stock. Beautiful cards..Each one is so different and so unique..Love all of them. You’ve been busy. The trellis gate card is pretty and I love the elephants are great. I really like that sentiment and the whole stamp set too. Wonderful cards you've created! I love all the different styles you used. The elephant card is fantastic! Each card is beautiful in its own way...and yes, that elephant card is something special! Very nice cards! I love that hand drawn walkway-wonderful! I love the scene you created with the fountain! That's such a fun use of the dies and perspective; it really looks different from everything else I've seen on the hop. I like your sense of humor with the purple elephant (and that sentiment set might need to jump into my shopping cart soon), and the nasturtiums!! Oh, those are gorgeous. I have got to do more colored pencil coloring on black, because every time I see it, I just want to reach through my screen and pet it. Thank you so much for sharing! I love the elephant card!! Thanks for sharing so many great cards! 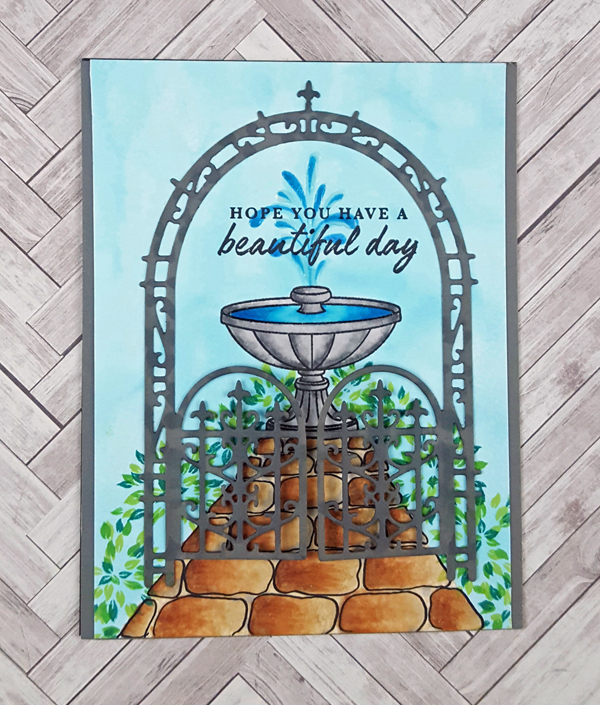 Love your fountain card with the new trellis die. Beautiful! Thanks for more great products from Hero Arts! What lovely cards you've created! And I love the array of styles of them. That first card is a beautiful scene and that stone path you drew and coloured is amazing and adds so much to the scene. And your elephant card is simply fabulous!! That sentiment is just perfect. You coloured them beautifully and I agree, all the work you put into it was definitely worth it. And then there's that last card. It is absolutely gorgeous!! I've come to realize that I love the ĺook of coloured pencils, especially on black and kraft paper,àn the detail you can add to any image with them. It amazes me every time. I think I'm going to have to invest in some polychromos pencil crayons for myself. Thanks for the inspiration! Thank you so much for all these gorgeous cards, so diverse and beautiful. There's a lot of inspiration on this post. I love the elephant stamps but also love the prayers! Decisions decisions! Love the fountain card with the gate, so much fun! Fabulous cards! Love the little garden scene on the first card! Beautiful scene on the first one. And I love a purple elephant!! Very clever heart shape earth, and the last card is so very lovely!! I enjoy all of your cards Libby! All kinds of creative! The elephant herd is really interesting. 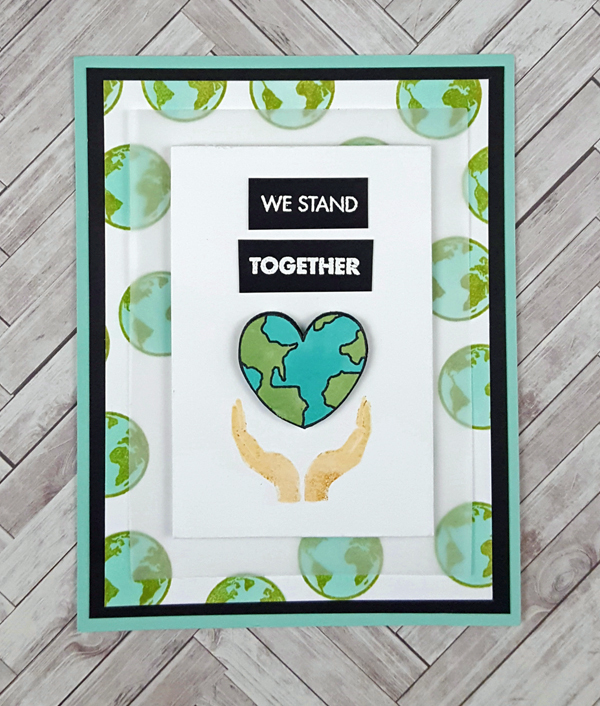 I also like your message and making of the stand together card. The coloring on the black is a great look that I need to try. Love your cards, especially the elephants! And the diamonds - so clever of you to think of using them that way - so classy!